Emily has been accumulating Barbies over the past 2 years. For awhile they lived in a bucket, their hair getting all tangled and gross. I knew there had to be a better way to store them. Enter Pinterest. Oh how I love Pinterest! 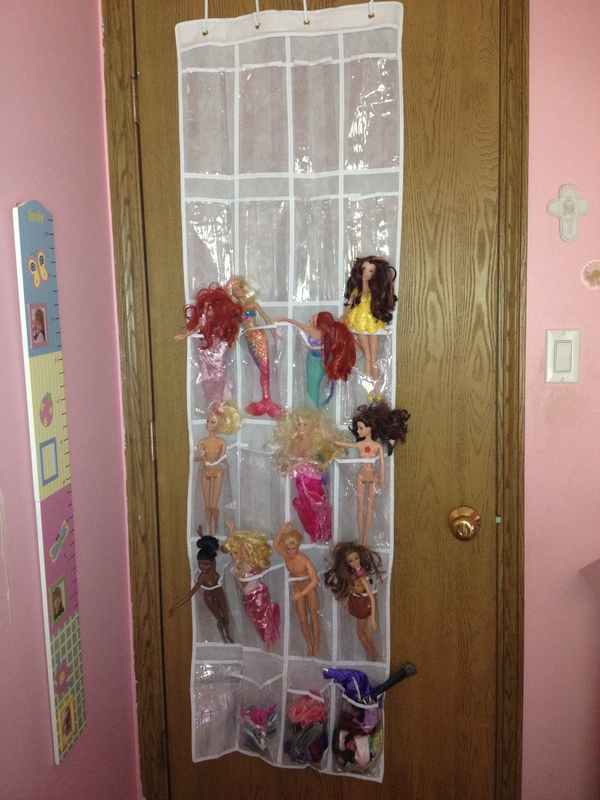 A neat way to store Barbies for only $5! I have always loved my slow cooker, crock pot, whatever you chose to call it. I am always on the hunt for recipes that tasted good and weren’t overly bad for you. My friend, Stephanie, told me about this book “Make It Fast, Cook It Slow“. I love cookbooks. I really do. I have a ton of them, many gathering dust. I decided that I would get this book from the library first to see if it would be worth purchasing. Must be a popular book because it took a month or two before I got it. I started going through the cookbook, writing down what recipes that I would be interested in trying. 5, 10, 15 recipes later, I decided that I really just needed to purchase the book. So I did! I have about 20-30 recipes I want to try out of it. So far, I have made 3. Huge progress, you think? Not so much. I am getting ready to make a menu for May so I will be pulling it out shortly to decide what I want to try next. My friend asked me to post the recipes that I have tried so the next few posts will be yummy! I have been reading “When You Eat at the Refrigerator, Pull Up a Chair” by Geneen Roth. The book is her 50 ways to feel thin, gorgeous and happy. I enjoyed the read. There are a few ways that really resonated with me. One was when she talked about wearing your “special” clothes on non-special days, especially on days where you feel pretty crappy about yourself. She states that by “wearing special-occasion clothes on any old day means being willing to believe that you are special on every old (and new!) day.” You should pick out some gorgeous clothes on days when you would tend to pick out your grubby sweatpants/yoga pants/stained t-shirts/insert your go-to clothes. You need to remind yourself that you are not a slug, that you are a human being that has bad days and move on. That you are fabulous, no matter what you ate the previous day, what the scale says, etc. The other one was a chapter on lagniappe (pronounced LAN-yap). One of its meanings is an extra that you weren’t expecting, but are now immensely glad to have. Try to live like every moment is lagniappe. People and possessions are fleeting. When you live like every moment is a gift and time is fleeting, every single blessed thing you see, feel and touch is lagniappe. t’s so easy to get carried away in the day-to-day grind. Feeling overwhelmed with responsibilities and worrying about having enough when enough is possibly too much. Clear as mud? Basically living my life like it is a lagniappe and, as the one song goes, like I am dying. It’s going to be an ongoing process, with many backslides. I just want to become more thankful for every blessing that I have. Back to the book, I would recommend it. While I didn’t “get” all 50 ways, many of them at least made me say “hmmm”. Wow! I saw this in my drafts just now. I meant to blog about this in May. Must have started it and not come back to finish. Guess now is as good of time as any…. Well, in May I decided that we needed a chore chart for Emily. She has been pretty good about doing her chores and helping around the house but I wanted to kick it up a notch. Teach her a little about spending, saving and earning. I came up with a basic chore chart. I am sure it will be adjusted and changed as time goes on but it works for now. I know the last two aren’t chores but I think she really needs to work on them. For everything she completes, we put a sticker or a check on her chart. At the end of the week we tally up the completed tasks and she receives a nickel for each one. Part of the money goes into her chore jar and part goes to her piggy bank. Emily decided that she is going to use her money to buy a Princess Tiana doll. She has been doing pretty well. Some days are better than others of course. She’s only 3 1/2 so that’s to be expected. I am pretty proud of her progress though. Eventually I’d like her to start doing chores without me having to ask or remind her but that’s down the road. I know there are ways that I can make this chart better. I am totally open to any ideas you have. Different chores, different methods, different rewards. Please share! Monday begins the library’s annual summer reading program. Emily is very excited about it. She had participated in it the past two years and really enjoys it. She is a little book-worm! It’s going to be a perfect motivator to get me moving on the “100 books to read before kindergarten” list. We have been going to the library but I have been bad about checking out books from this list. Hopefully will be able to knock it down some more! The books in bold are the ones we have read. Does a Cow Say Boo? A while back, I posted the “100 books every child should read before kindergarten” list that I found on the internet. We have made some progress! Out of 100 books, we have currently read 31. Not too bad for an almost 3 year old. I love that Emily loves books. We seriously go to the library at least once a week – sometimes twice. Our bag is full and we read all of the books at least 3 or 4 times. That’s a love of reading! I love cookbooks. Plain and simple. Buying them, renting them from the library- it doesn’t matter. I just like recipes. My sister asked me awhile back if I had any good recommendations on toddler cookbooks. I gave her the name of a couple that I had and looked on Amazon for some more. I came across one that I wanted to check out. I’m a try before you buy kind of gal so I requested it from the library. A month or so later (apparently, a lot of people wanted to peruse it) I got to go through it. There were tons of recipes in there! 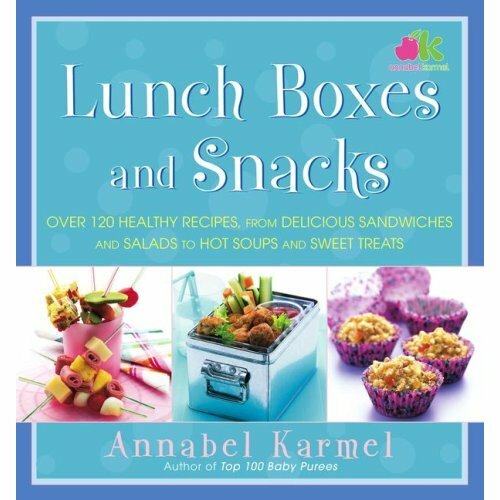 I think I will have to buy Annabel Karmel’s book. I did note some recipes that I HAD to try though. Yesterday we tried our first recipe. I think it went over pretty well. Using a rolling pin, flatten the bread until it is about 1/4 inch thick. Mix the tuna together with 1 tablespoon mayonnaise, the ketchup and the Tabasco (if using). Spread the remaining mayonnaise over the bread. Spread the tuna in a line about 1/2 inch from one edge of each slice. Arrange the cucumber strips on one side of the tuna and grated carrot on the other side. Roll up from the filled end and press down to seal. Trim the ends to neaten using a sharp knife, then cut into three little rolls. A long while ago I read a post on one of my favorite craft websites, No Time for Flashcards, about a book by Charles G. Shaw. It piqued my interest and I tucked the title away so I could get it from the library. Three months later, I remembered! I am so glad I did. Is it spilt milk? Is it an ice cream cone? Emily was kept guessing until the end. She loved the book! We have read it probably 5 times since our library trip earlier this week. On No Time for Flashcards, they did a cute little art project in conjunction with the book. I did my own spin on it. She used cotton balls while I used crumpled tissue paper. I thought Emily might like helping me crumple paper but I was wrong. I think Emily enjoyed the glue part more than anything! She did like putting the paper onto the glue. She sure was proud when she showed it to Daddy when he got home. She did not want to hold up her cloud!! I was checking out one of my favorite blogs the other day, The Crafty Crow, when I saw a pretty cute Easter craft from another site linked there. I am always on the lookout for fun activities to do with Emily so I clicked on the link. I hit the jackpot!!! This site was the mecca of activities, in my opinion. The site is Preschool Rock. There are tons and tons of craft ideas for toddlers and preschoolers. I haven’t had a chance to really delve into the site yet but I have already seen a handful of crafts that I am going to make with Emily. I am just super excited and had to share the site with my friends! The link I had was just for the craft section. If you go to the home page, you will find even more cool stuff! Activities, food, nutrition, you name it. I can’t wait to check out the site even more! I am seeing much more stuff than just crafts!! You might have noticed or not the lull in my posts. There is usually something to read a few times a week. I looked at my little calendar thing and there was only 3 for the entire month of March and it’s the 11th already. Whoops! Sure Emily and I have been in the middle of potty training but that’s not my reason. The reason I have been so preoccupied is crack. Crack you say? Yes, crack. Crack in the form of books. I had never heard of Stephenie Meyer or the Twilight series before my best friend Cindy’s husband’s birthday. She and her friend were excited talking about seeing the movie. They asked if I had heard of it. Nope. She explains to me that it’s a series of books about love and vampires. They were aimed at teenagers in the beginning but the books had put many grown women into a swooning frenzy. She asked if I would like to read them. I was never into Ann Rice and her vampire books like my sister was. I didn’t know if I wanted to read them. They weren’t really my cup of tea, in my opinion at the time. Cindy, being the wonderful friend that she is, brought her set to me anyway. And they sat. They sat in the bedroom for a week or two. Cindy asked me once or twice if I had gotten around to reading them. By that point, almost everyone mom in the gym had been chattering about the books. I decided to jump on the bandwagon and see what all the hubbub was about. Oh. My. Goodness. I am SOOO glad that Cindy brought me the books. I could not put the down. I like to read but it’s not my passion. I read so many books to Emily during the day sometimes reading is the last thing I want to do during my down time. There are only a few books that have really gripped me and made me unable to put them down. I can now add these four to the list. I read four 500+ books in less than two weeks. That is a record for me. I seriously could not put them down. They were like my drug and I needed my fix. If you have never read the books (I am not sure how many of you are out there since I am late to the party) I truly suggest picking up, borrowing, bartering, stealing (just kidding!) all four books. You will not regret it. I promise that. Just don’t shoot me if you do! I have never read a book that had me gripped to my seat like these books by Stephenie Meyer. While reading I would find myself holding my breath, anxious, still as a log, tense, happy and everything in between. I probably sound like a true dork but these books really drew me in. I think Stephen is really happy that I am done. He has his wife back. After I finished the last book, Breaking Dawn, I was a bit sad. And that is true dorkiness. I am excited though. The Twilight movie comes out soon. I have not seen it and am ready to! I have several friends who have it pre-ordered so I shouldn’t have anything to worry about. If all else fails, it’s on pay-per-view! I didn’t see any trailers or movie posters before I read the books so the characters are totally different than what I had pictured. It should be pretty interesting to see how they turned the book into the movie. Thanks to all my friends who sucked (pun intended) me into this awesome book series! I really enjoyed reading all four books and cannot wait to see the movie and movies as the come out. Can I count on viewing parties?! ?